Fan, H., Wang, S., and Liu, J. (2014). "The influence of particle size of starch- sodium stearate complex modified GCC filler on paper physical strength," BioRes. 9(4), 5883-5892. Ground calcium carbonate (GCC) was modified with starch/sodium stearate complexes and used to prepare modified GCC of different size by use of a BSJ-200 oscillating sieving machine. Modified GCC was characterized by scanning electron microscopy (SEM) and particle size analysis. Eight kinds of modified GCC of different size and a kind of modified GCC without screening were used in papermaking and the paper strength properties, especially in tensile, tear, and burst index, were investigated. It was found that the size of modified GCC played an important role in the physical properties of the paper. The best size of modified GCC was within the range 35 to 54 µm. Potential benefits of the use of filler include the reduction of costs and improvements in the properties of traditional paper (Shen et al. 2008; Lu et al. 2010; Cheng et al. 2011; Huang et al. 2013). High ash content paper had become an important trend in papermaking technology in recent years (Jones 2000; Yuan 2008; Fan et al. 2012). Current research on modified fillers was concentrated on fiber loading, which incorporates fillers into the pulp fines-filler complex by premixing fillers with fines/fibrils or by in situ precipitation of filler particles on fines/fibrils (Silenius 2003; Subramanian et al. 2005, 2006, 2007, 2008), filler surface modification (Laleg et al.2008; Ibrahim et al. 2009), loading of the lumen and/or cell walls of pulp fibers (Klungness et al. 2000), and synthetic fillers (Zhao et al. 2008). The tensile strength, tear strength, and burst strength are important physical characteristics of paper. It has been widely accepted that when mineral fillers are used in papermaking, especially at relatively high loading levels, they could usually result in strikingly reduced paper strength (Kurrle 1996; Silenius 2003; Yan et al. 2005; Subramanian et al. 2005, 2006, 2007, 2008; Zhao et al. 2005; Yoon and Deng 2006; Yoon 2007; Deng et al. 2008; Fahmy and Mobarak 2008; Fairchild 2008; Laleg et al. 2008; Ibrahim et al. 2009; Song et al. 2009). In the current study, mineral filler modified by polysaccharides and their derivatives was evaluated as a way to solve the problems associated with fillers (Yan et al. 2005; Zhao et al. 2005; Yoon and Deng 2006; Deng et al. 2008). Polysaccharides and their derivatives, such as cellulose, starch, and chitosan, have been used as modifiers due to their ability to form hydrogen bonds with cellulosic fibers (Bai and Fan 2011). It had been reported that calcium carbonate modified by starch/fatty acid complexes could significantly reduce the negative effect of fillers on paper strength (Shen et al. 2009; Fan et al. 2012). The starch’s bonding ability, along with the diadochy of sodium and calcium ions associated with the mineral, was beneficial to the precipitation of starch/sodium stearate complexes on GCC (Zhang 2013). However, there has been little research regarding the effect of size of the modified filler agglomerates on the properties of modified filler. In this study, by encasing ground calcium carbonate (GCC) within a starch-sodium stearate complex and screening out particles with sizes between 18.6 µm and 74.1 µm under certain conditions, we explored how modified GCC size affected the physical strength of paper. Bleached eucalyptus pulp with a drainage degree of 32 °SR was supplied by Henan Tianbang Co., Ltd. (China). The ground calcium carbonate GCC was supplied by Guangning Paper Co., Ltd. (China), and corn starch by Guangdong Shenzhen Taigang Food Co., Ltd. (China). Sodium stearate, cationic polyacrylamide (CPAM), and cationic starch were all supplied by Tianjin Kemiou Chemical Reagent Co., Ltd. (China). Starch (5 g) was added to 167 mL of ultrapure water in a 500-mL tri-neck round-bottom flask and allowed to disperse for 10 min. The flask was heated in a water bath to 95 °C and stirred at 400 rpm for 30 min. Sodium stearate (0.8 g) was added to the mixture and stirred at 150 rpm for 30 min. Finally, 20 g of GCC diluted to 30%w/v in ultrapure water was added to the starch-sodium stearate solution and the mixture was stirred at 70 °C for 20 min. The modified GCC was cleaned by ultrapure water five times to make sure there was no starch dissolvable in water. The modified GCC was dried in a SX muffle oven (Zhongyuan Chemistry Instruments Ltd; Guangzhou, China) at 105 °C for 4 h.
Modified GCCs of different sizes were obtained with a BSJ-200 oscillating sieving machine (Yong da Ltd.; Xinxiang, Henan, China) using mesh sizes of 200, 250, 300, 325, 380, 400, 500, and 800. The particle size of the GCC and modified GCC were determined by dynamic light scattering using a Malvern 2000 laser particle analyzer (Malvern Instruments Ltd., UK). The particles were suspended in ultrapure water at a concentration of 5% to 10%. Dried samples of GCC and modified GCC were mounted on aluminum stubs with tape and sputter-coated with a gold alloy. Samples were observed using an EVO 18 Special Edition scanning electron microscope (Carl Zeiss, Germany) operating at an accelerating voltage of 10.0 kV. The bleached eucalyptus pulp was diluted to 0.3% in tap water, and various concentrations (percent) of modified GCC (based on slurry) were added during handsheet making. The mixture was dispersed by a GBJ-A fiber standard dissociator (Zhongyuan Chemistry Instruments Ltd., Guangzhou, China), and 0.05% CPAM (based on dry pulp) was added as a retention aid. The handsheets were formed using a Rapid-Köthen Sheet former (RK3-KWTjul; PTI Ltd., Austria) at a basis weight of approximately 72 g/m2. Handsheets were placed in an ISO constant temperature and humidity chamber for 24 h (23±1 °C, 50±2% RH). The tensile, burst, and tear strength of the papers were measured using an L&W CE062 tensile testing apparatus, an L&W CE180 burst testing apparatus, and an L&W 009 tear testing apparatus (Lorentzen & Wettre, Sweden), respectively. Table 1 shows the relationship between GCC particle size and the mesh screens. Note: The average particle size of modified GCC (unscreened filler) was approximately 34.3 m and the size of unmodified GCC was 14.8 µm. SEM images of paper-sheet filled with screened particle sizes of GCC are shown in Figs. 1(a)-(c), and an image from paper made with unscreened GCC is shown in Fig. 1(d). Paper-sheets with different size of GCC exhibited different physical appearance. In Fig. 1(a), the small filler particles (Mod-24) appeared to be somewhat “clustered” and could not link up well with the fibers. A similar situation is shown in Fig. 1(c), involving the fraction of large GCC particles or agglomerates (Mod>74) after modification. By contrast, Fig. 1(b) shows fillers particles (Mod-41) evenly distributed within the paper. The paper made with unscreened sizes in Fig. 1(d) showed a distribution that was not as even as for Mod-41, but better than for Mod-24 or Mod>74. In the paper made from unscreened modified GCC the particles were not of uniform size. The strength properties (tensile, burst, and tear indices) of handsheets prepared with modified GCC of different sizes at concentrations of 15% to 45% were evaluated. The size codes shown in the figures are defined in Table 1. The unscreened GCC particle size was labeled as “Unscreened”. The sheets made with unmodified GCC particles (average size 14.8 m) are identified as “Control”. As Fig. 2 shows, the tensile strength of papers was reduced with an increase in ash content. At the same ash content, the tensile index of paper with modified GCC of medium size (Mod-41) was higher than the others, while the tensile index of paper filled with the largest modified GCC particles (Mod>74) was the lowest. At the same ash content, the tensile index of paper filled with modified GCC of medium size (Mod-41) was at least 40% higher than that of the largest class of modified filler particles (Mod>74). The paper filled with modified GCC of intermediate sizes (Mod-37, Mode-41, Mod-40, and Mod-58) were higher in tensile strength than the paper filled with unscreened modified GCC. The tensile strength of paper filled with the smallest modified GCC particles (Mod-24) and the largest (Mod-68 and Mod>74) was lower than paper made with unscreened modified GCC. 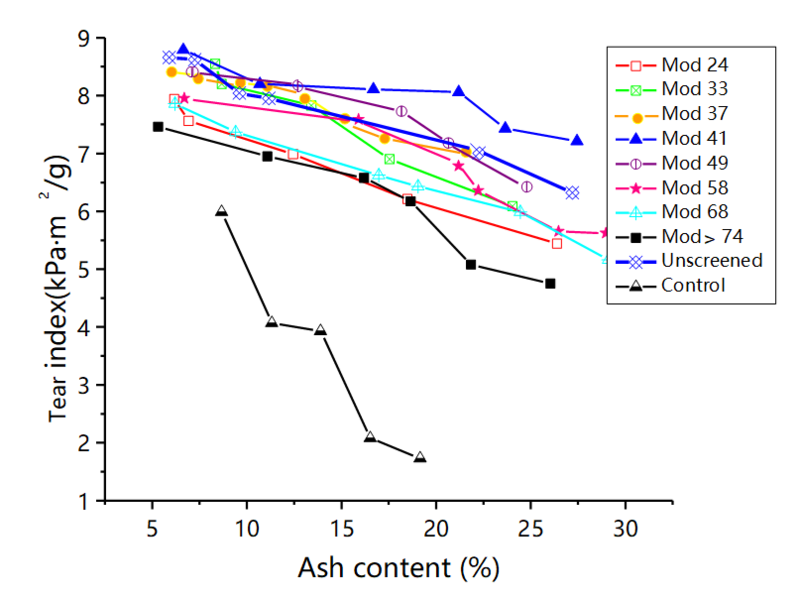 The tensile index of paper filled with modified GCC of medium size (Mod-41) with an ash content of 20% was still higher than the tensile index of paper filled with modified GCC of the largest size (Mod>74) with an ash content of 5%. From a different perspective, when the tensile index was constrained to be about 55 N∙m/g, the paper filled with the largest modified GCC (Mod>74), the ash content was only 5%, while the ash content of paper filled with modified GCC of intermediate size (Mod-41 or Mod-49) could reach 25%, about 400% higher at the same level of strength. This indicated that the size of modified GCC had an important effect on paper tensile index. It was worth noting that the tensile index of paper filled with modified GCC of the second smallest size (Mod-33) was close to that of the second largest size (Mod-68). Compared with the control (unmodified GCC), the tensile index of paper filled with modified GCC was much higher, especially at ash levels above about 12%. As shown in Fig. 2, the tensile index trend of paper filled with unmodified GCC was much steeper than that of paper filled with modified GCC. When the ash content was about 20%, the tensile index of paper filled unmodified GCC was only about 17 N∙m/g, while the tensile index of paper filled with the largest modified GCC (Mod>74), the lowest in whole tensile index of paper filled with modified GCC, was about 45 N∙m/g. As shown in Fig. 3, the tear index of papers filled with unscreened modified GCC was almost as high as the other formulations except in papers filled with modified GCC of intermediate sizes (Mod-37, Mod-41, and Mod-49). The graph also shows that modified GCC of medium size (Mod-41) had the least negative effect, while the modified GCC of the largest size (Mod>74) had the highest negative effect. For example, the tear index of paper filled with modified GCC of medium size (Mod-41) was about 7.7 kPam2/g when the ash content was 22%, while the tear index of paper filled with modified GCC of large size (Mod>74) was 7.5 kPam2/g when its ash content was 5%. The tear index of paper filled with unscreened modified GCC was close to the tear index of paper filled with modified GCC of intermediate sizes near to the optimum (Mod-37 and Mod-49). The modified GCC of intermediate size, such as Mod-37, Mod-41, and Mod-49, had less negative effect on the tearing index. The modified GCC of large and small sizes were not as effective as modified GCC of intermediate size (Fig 3). It is worth noting that the tear index of paper filled with modified GCC of second-to-smallest size (Mod-33) was close to that of the second-to-largest size (Mod-68). The tear index of paper filled with modified GCC was all much higher than that of paper filled with unmodified GCC (Fig. 3), especially at ash levels above about 15%. At the ash content of 20%, the tear index of paper filled with modified GCC of large size (Mod>74) (5.8 kPam2/g) was much higher than that of unmodified GCC (1.5 kPam2/g). From Fig.4, it is clear that the burst index of paper filled with modified GCC of medium size (Mod-41) was higher than the other papers, especially modified GCC of the largest size (Mod>74). Modified GCC of another two intermediates sizes (Mod-37 and Mod-49) were the two sizes that performed close to Mod-41, indicating that the modified GCC of medium size (35.2 to 54.0 µm) had less negative effect on the burst index; it was found that the modified GCC of second-to-largest size (Mod-68) had the highest negative effect on the burst index. 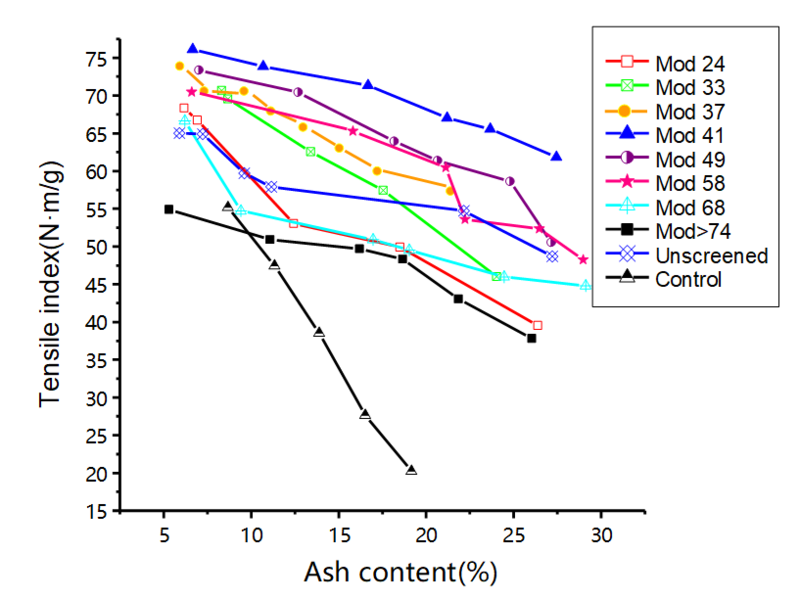 For instance, when the ash content was 5%, the burst index of paper filled with modified GCC of Mod-68 was about 3.6 mN·m2/g, while the burst index of paper filled with modified GCC of medium size (Mod-41) was about 5 mN·m2/g when its ash content was 26%. The former was more than 500% higher than the latter in ash content at the burst index of 3.5kPam2/g. It was worth noting that the burst index of paper filled with modified GCC of second-to-smallest size (Mod-33) was close to that of the third-to-largest size (Mod-58). Compared with the Control sample (unmodified GCC), the burst index values of paper filled with modified GCC were all much higher, especially at ash levels above about 12%. The burst index of paper filled with control was only about 1 mN·m2/g at the ash content of 20%, while the burst index of paper filled with modified GCC of large size (Mod>74) was about 2.5 mN·m2/g, about 2 times than the former. From the above discussions, the particle size of the starch-sodium stearate complex modified GCC filler had a great impact on the physical strength of paper. As Figs. 2, 3, and 4 show, with the growth of ash content, the tensile strength, the tearing strength, and the bursting strength of the paper were gradually reduced. The modified GCC of medium size (39.0 to 43.1 µm, Mod-41) had the least negative effect on paper physical strength than modified GCC of other sizes. The modified GCC of intermediate sizes (Mod-37, Mod-41, and Mod-49) had less negative effect than the modified GCC of larger or smaller size on paper physical strength. This was because the gelatinized starch turns the component particles into single agglomerated units, and the starch swells only when there is some water in the mixture. Starch molecules in the granules were still in a state of intense crosslinking, and most of the filler particles gathered into large flocculant polymer groups with starch condensation. The group was firmer than the fibrous-network structure. The starch gel coated on the surface of the filler still could bond with fiber. Furthermore, the large number of hydroxyl groups in starch molecules contribute to a good film-processing ability. When the paper is heated during the drying process, the GCC modified by starch-sodium stearate compounds swell into membranes that could bond GCC with fiber. Such contributions to bonding then decrease the decline of the fiber-fiber bonding with increasing filler content. By gelling and flocculation of the bigger sized particles, the filler retention could be improved and the contact area of filler and fiber could become smaller. On the other hand, even larger particles would tend to interrupt the uniformity of the paper; as a consequence, paper strength could be decreased significantly. On balance, it could be easily found that the best size of modified GCC was not too small or too big, but a medium size. It has been reported that the smaller the filler, the further the negative effect on paper physical strength (Tang et al. 2003). The large size modified GCC readily reduced the fiber-fiber bonding, which agreed with the phenomenon shown in Figs. 2, 3, and 4. This was mainly because that the larger particles induced by modification destroy the uniformity of paper formation, which adversely affects the paper physical strength. Therefore, the size of the modified GCC played an important role in the performance of modified GCC, with an optimal size for modified GCC. In addition, compared with unmodified GCC, modified GCC performed much better in tensile index, tear index, and burst index of filled paper. This was attributed mainly to the fact that modified GCC can form hydrogen bonds with fibers, while unmodified GCC could not. Also, the unmodified GCC particles, being smaller than even the smallest of the modified GCC classes, would tend to be more efficient in covering up the surface of fibers, thus getting in the way of inter-fiber bond formation. The size of modified GCC played an important role in the physical properties of the paper. The modified GCC of medium size (39.0 to 43.1 µm) had the least negative effect on the paper physical properties. Modified GCC over a somewhat wider intermediate size range (35.2 to 54.0 µm) proved to be the most suitable size for paper strength properties. The modified GCC with size smaller or larger than the medium size (35.2 to 54.0 µm) had more negative effect on paper physical strength, especially the smallest of the modified GCC (18.6 to 29.9 µm) and the largest modified GCC (> 74.1 µm). The smallest modified GCC (29.9 to 35.2 µm) and the second largest category of modified GCC (61.1 to 74.1 µm) were not different from the unscreened GCC on paper physical properties. At the same physical strength, paper filled modified GCC of the medium size (39.0 to 43.1 µm) contained at a 300% higher amount of GCC than that prepared with the largest size class (>74.1 µm). The paper filled with modified GCC exhibited higher tensile index, tear index, and burst index than unmodified GCC. The authors would like to acknowledge support from the Fundamental Research Funds (12C26214405137) for the Central Universities of China. The authors also wish to thank Jun Long, Binfeng Xu, and Ming Wang for their kind assistance in performing the relevant experimental work for this paper. Bai, R.-W., and Fan, H.-M. (2011). “Preparation of starch-stearic complex modified PCC filler and its application as paper filler,” China Pulp & Paper 30(1), 5-9. Deng, Y., Yoon, S. Y., Ragauskas, A. J., and White, D. (2008). “Methods and compositions for papermaking and surface-modified fillers for papers,” US Patent 2008087396 A1. Fahmy, T. Y. A., and Mobarak, F. (2008). “Nanocomposites from natural cellulose fibers filled with kaolin in presence of sucrose,” Carbohydrate Polymers72(4), 751-755. Fairchild, G. H. (2008). “Treatment of inorganic pigments with carboxymethylcellulose compounds,” European Patent 0731826 B2 20080319 (EN). Fan, H.-M., Wang, D.-X., Bai, W.-R., and Liu, J.-A. (2012). “Starch-sodium stearate complex modified PCC fillers and its application in papermaking,” BioResources 3(7), 3317-3326. Jones, P. (2000). “Never before has paper been more challenged than now. With e-commerce growing, paper must adapt. But that doesn’t mean it is on its way to extinction,” TAPPI Journal 83(5), 40-43. Kurrle, F. L. (1996). “Process for enhancing sizing efficiency in filled papers,” US Patent 5514212 A.
Laleg, M., Collins, R., Gagne, D., and Middleton, S. (2008). “Latex-treated filler slurries for use in papermaking,” WO Patent 148204. Shen, J., Song, Z.Q., and Qian, X.R. (2009). “Modification of papermaking grade fillers: A brief review,” BioResources 4(3), 1190-1209. Silenius, P. (2003). “Filler for use in paper manufacture and method for producing it,” European Patent 0930345 A3. Song, D., Dong, C., Ragauskas, A. J., and Deng, Y. (2009). “Filler modification with polysaccharides or their derivatives for improved paper properties,” Journal of Biobased Materials and Bioenergy 3(4), 321-334. Subramanian, R., Maloney, T., and Paulapuro, H. (2005). “Calcium carbonate composite fillers,” TAPPI Journal 4(7), 23-27. Subramanian, R., Maloney, T., Kang, T., and Paulapuro, H. (2006). “Calcium carbonate-cellulose fibre composites: The role of pulp refining,” Paper Technol. 47(8), 27-31. Subramanian, R., Fordsmand, H., and Paulapuro, H. (2007). “Precipitated calcium carbonate (PCC)-cellulose composite fillers: Effect of PCC particle structure on the production and properties of uncoated fine paper,”BioResources 2(1), 91-105. Subramanian, R., Fordsmand, H., Paltakari, J., andPaulapuro, H. (2008). “A new composite fine paper with high filler loading and functional cellulosic microfines,”Journal of Pulp and Paper Science34(3), 146-152. Tang, Z.Y., Chen, G., Zhang, H. W., and Tang, A. M. (2003). “The effect of the properties of fillers on retention and paper strength,” Paper Science ＆ Technology 22(6), 51-53. Yuan, J.-W. (2008). The Study of a New Fiber Loading Technology for High Ash Content Paper, Master thesis, Nanjing ForestryUniversity, Nanjing. Yoon, S. Y. (2007). Bonding Material Coated Clay for Improving Paper Properties, Ph.D. thesis, Georgia Institute of Technology. 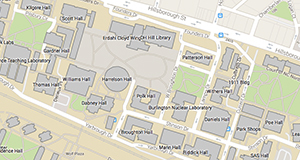 Zhao, Y. L., Hu, Z. S., and Ragauskas, A. (2005). “Improvement of paper properties using starch-modified precipitated calcium carbonate filler,” TAPPI Journal 4(2), 3-7. Article submitted: June 23, 2014; Peer review completed: August 1, 2014; Revised version received: August 2, 2014; Accepted: August 3, 2014; Published: August 8, 2014.